...Set: Supernatural 6x05 "Live Free or Twihard"
I would just like to begin by saying how absolutely hilarious that opening scene was. Man oh man. If I'm being honest, it took me a second to clue in to the practically word for word interpretation of a certain vampire series phenomenon, because at first I was wondering at the slow pace. But then it clicked and I could not stop laughing. The slow pace? Exactly like that aforementioned series. There was a paper cut, much brooding, and general merriment had by yours truly. And the characters' names? Kristen and Rob! Ah, love it. Meanwhile, the boys have cottoned on to the vampire shenanigans, and are tracking them down in town. Dean has got a bit of a spring in his step because they happen to be nearby wherever be moved Lisa and Ben to, so he can shimmy on over for a visit after they're done with the case. Of course, the best laid plans... yeah. I just realized I don't know the second half of that saying. Oh well! You know what I mean, right? Of course you do, you may even know the second half of the damn saying! Tangent alert! Sam and Dean figure out that there is a nest of vamps in town, and that they are luring pretty people to join them fairly easily thanks to vampires being all the rage lately. They track down the usual haunt for victims, and just when they think they've tracked down some likely candidates, things go terribly wrong. Dean follows a faker out into some dark alley, then gets jumped by an actual real vampire. Sam runs around the corner, for what would be a just in time moment, except that he just stands there and watches as the head vamp dude (did he ever get a name? If he did, I never registered it!) drips some of his blood into Dean's mouth! What in the world, Sam! I think we can all agree that if anyone was on the fence about there being something wrong with Sam, this confirmed it. Something is not right when Sam gets a creepy grin when Dean's being turned into a vampire. Yep, Dean gets turned into a vampire! And with that comes a sensitivity to light and sound, and a big ear for blood pumping oh so smoothly through Sam's very calm veins. Sam suggests they call up Papa Campbell for help, even though Dean wants him to just get it over with and kill him. Obviously that's not going to happen, Dean. Dean decides that before he goes, though, he wants to say goodbye to Lisa and Ben. Dude! What a terrible idea, which he soon finds out once he's there. Because though he wants to get close, that hankering for the red stuff is getting the better of him. But he does manage to get out of there before drinking either of them. Which, it turns out, is essential. Because when Papa Campbell shows up, he informs them that his grandfather knew a way to change vampires back, but it only works if they haven't fed on any blood. How does this knowledge not get around, I ask? You'd think someone else would've known that and spread it around. And how does Papa Campbell have access to his grandfather's journal when he was dead for however many years? Apparently some safe place that no one disturbed for all that time? Clearly they do not want me to be thinking this much about it, but hey. Hey! That's what we do. Anyway! To get this magical mystery potion to work, they need some blood from the vampire who turned Dean. Dean decides the best way to do it is for him to go into the nest, since he's now one of them. At first, things seem to be going rather well. The head vamp dude is welcoming him with open arms, and exhibiting some not so subtle hints that he rather, ahem, fancies Dean's pretty prettiness. Well, don't we all? 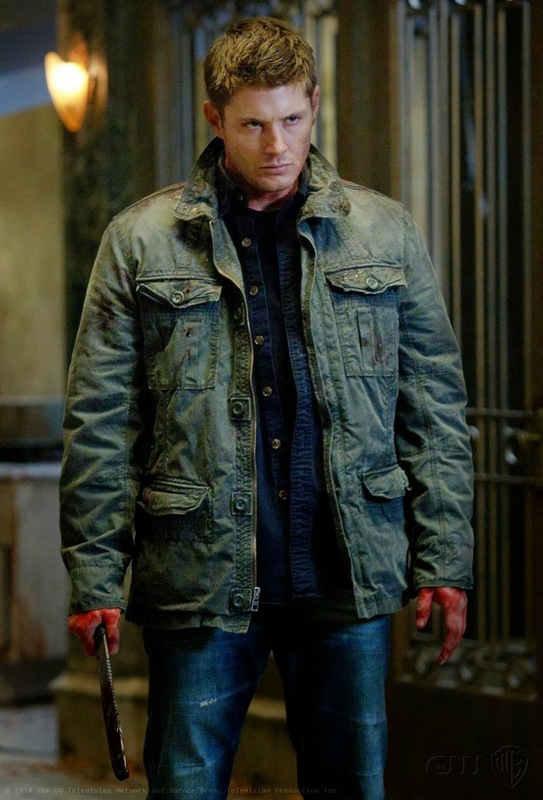 Dean is ready to stab the dude with some dead man's blood, but apparently gets a little too antsy about it, because he manages to let a drop of it splat to the floor, which leads into a full blown vampire hissy fit. Only, that gets cut short for some random vampire psychic message thingy, apparently sent from the alpha. Some sort of plans to take over the world or something? It was vague. When Dean starts to awaken, though, the other vampires are ready to tear him limb from limb. Lucky Dean's not so easy to take down, because he manages to machete chop a lot of their heads off, including the head vamp dude. They brew up some of the magical mystery let's-make-you-a-human-again potion, which has the interesting effect of giving Dean a reverse view of the last hours since he was first turned, including a special long pause on Sam's creepy grin while he was getting dosed. Dean's worst fears? Pretty much confirmed. And when he awakens, Sam's first concern is not about his well-being, but rather about what he saw and learned in the nest. Yeesh! Laying it on thick, aren't we? Even Papa Campbell was wondering whether Sam let Dean be turned on purpose. No need to wonder, dude, it's true. Sad but true. The ending scene is sort of a mirror of the first with the boys, with Dean trying to call up Lisa, but getting cut off on her voice mail. Awww. - WHOA machete action Sammy! - Any and all references to Twilight and general teenage pop culture were hilarious. Though, how does Dean know so much of it? Yes, he lived in the regular world for a year, but he lived with a tween boy, not a tween girl. - Was that the last we're going to see of Lisa and Ben? Rather a shame. - What exactly is up with Sam? I read something, but I don't remember if it was a theory or like an interview snippet. Hmm. I won't spoil anyone, but it does look like we're going to get some answers on it all next week. - How long until we meet that alpha vampire? I've seen that actor who was playing him in quite a few other things, so you know he'll be coming back in more than just some hazy dreamy vision thing. The full saying is "The best laid plans of mice and men aft gang agley." That's not a typo -- "aft gang agley" is Scots for "often go astray." The chunky hairy vamp guy who turned Dean was named Boris. @sugetarc - Wow, I never did know that whole saying at all! How interesting. Thanks! And thanks for the name. I guess I just wasn't paying attention. Not too important since he died by the end of the episode anyway! @Laura - I've actually heard this idea a few times now, and I kind of agree. Certainly since season two things started to sway more Dean, and he's tended to have the more meaty episodes. Should we call it the Jensen effect? Because when he came on Dark Angel the second season, suddenly his character was way more interesting than the male lead, who I had previously been obsessed with. I do have hope that they'll start bringing things back to Sam, it has seemed like a conscious choice this season to keep him more on the sidelines so far. I hope I'm not being naive. AND I'm sorry for such a lengthy response! !